VICENTE MANANSALA | Geringer Art, Ltd.
MANANSALA, VICENTE SILIVA b. Macabebe, Pampanga 22 Jan 1910 d. Aug, 1981. National Artist in Painting. He is the son of Perfecto Q. Manansala and Engracia Silva. He married Hermenegilda (Hilda) Diaz, with whom he had one child. As a newsboy and bootblack in Intramuros, he expressed his early creativity designing kites and making charcoal sketches. At 15, he studied under the turn-of-the-century painter Ramon Peralta while doing signboards for a painting shop. He entered the University of the Philippines School of Fine Arts in 1926 and graduated in 1930. He undertook further studies and training at the Ecole de Beaux Arts in Montreal, Canada, in the USA, and in France where he had a brief stint under Ferdinand Leger. Subsequently, he earned a living as illustrator for the Philippines Herald and Liwayway and layout artist for Photonews and Saturday Evening News Magazine during the 1930s. As a member of the Thirteen Moderns and the neo-realists, he was at the forefront of the modernist movement in the country. With the issues of national culture and identity in focus after WWII his works were those of the other early modernists which reflected the social environment and expressed the native sensibility. He held his first one-person show at the Manila Hotel in 1951. Manansala consistently worked in the figurative mode, with the exception of a few abstract works. Shunning Amorsolo’s rural idylls, he developed a new imagery based on the postwar urban experience. The city of Manila, through the vision of the artist, assumed a strong folk character. He painted an innovative mother and child, Madonna of the Slums, 1950, which reflected the poverty in postwar Manila. Besides the mother-and-child, his subjects included jeepnevs, barong-barong, cockfighters, families gathering for a modest meal, and Quiapo women vendors of various goods. His women vendors sit veiled and hunched over their wares, their brown impassive faces like the archaic bulol, blocklike with broad planes, their large bare feet projecting from the hem of their saya. He did still life’s of native fruits, vegetables, and dried fish in the setting of a native kitchen with its folk utensils, palayok, kawali and almires, against capiz windows. The cubist aspect of Manansala’s work rests largely on the geometric facetting of forms and in the shifting and overlapping of planes. But his facets and planes are broader than in original cubism as they bring out larger rhythms. Here and there, he incorporates linear decorative patterns, as in the ironwork curlicues of gates and windows. In his work, he developed the style of transparent cubism which was generally shared by his fellow neo-realists Cesar Legaspi and Romeo Tabuena. Unlike analytical cubism, which arbitrarily fragments and dissects the figure into complex abstract compositions with only clues of the subject remaining, Manansala stayed close to the figure which he simplified to its basic geometric shape. He went through the black-and-white phase of crucifixions and madonna-and-child paintings, but, on the whole, he used color in all its folk vibrancy, sensuous appeal, and evocative power. In composition, his works often feature lines of perspective with receding space, although shallow; but recession in depth is simultaneously defined by lines and planes which create spatial ambiguities. His still life’s have a tapestrylike quality, the various objects from the domestic context, not fragmented but left integral, occupy he entire visual field, bright elements on a dark, ambiguous space, and at times showing the influence of I7th century paintings of Dutch interiors with their checkerboard motifs. As a whole, Manansala reinterpreted or indigenized cubism as he drew his themes from the familiar Filipino environment. Manansala’s vision of the city and his fundamentally native Filipino approach to his subjects would influence numerous artists who took up his folk themes within an urban context. 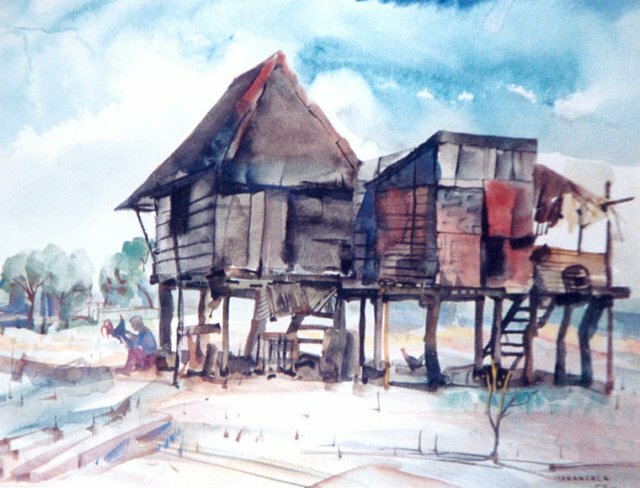 Among those who show his influence are Mauro Malang Santos, with his own version of folk romanticism in paintings which convey the fragile, makeshift character of the 1950s, and others from the University of Santo Tomas where Manansala taught for a time, such as Antonio Austria, Angelito Antonio, and Mario Parial. Like him, they draw their inspiration from the folk, their occupations and pleasures. He influenced Manuel BaIdemor, whose roots are in Paete, Laguna, as well as some Laguna lakeshore artists. Manansala’s art exemplified a solution to the problems of the 1950s in terms of the use of modem Western idioms and their local transformations, and in terms of the subject matter and content of art reflective of a people’s identity. Manansala won first prize for Barong-barong $ 1 in the 1950 Manila Grand Opera House Exhibition. His awards from the Art Association of the Philippines include: third prize, Banaklaot, 1948; second prize, Kahi (Scratch), 1953,second prize, Fish Vendors, 1955; third prize, Best Served, Well-Gained, 1955; second prize, Give Us This Day, 1962; and best in show, Give Us This Day, 1962. He received the Republic Cultural Heritage Award in 1963. He also received the Patnubay ng Sining at Kalinangan Award from the City of Manila in 1970 He was proclaimed National Artist in Painting in 1982.